Many people do not understand what true surround sound involves. True surround sound must come from a multi-channel audio source such as a commercial DVD-Video like a hollywood movie or a digital TV broadcast in multi-channel sound like Dolby Digital 5.1 surround. The audio channels are individual discrete sound streams which must be decoded before being heard by the listener. How are they decoded? By a sound processor capable of handling the various audio formats used today for surround sound. A sound processor is a component such as an Audio/Video Receiver with DTS and/or Dolby decoding capability. Only after processing can the sound be sent to 6, 7 or more loudspeakers positioned around the listener. No, your TV cannot handle real surround sound, only simulated surround. What do you need for surround sound? You need a surround sound source, at least Dolby Digital 5.1, such as broadcast TV, cable TV, satellite TV or a movie disc like Blu-ray Disc or standard DVD-Video and you need hardware such as a surround sound receiver, speakers (five speakers and a subwoofer), a TV, a digital audio cable, speaker wire and other components like a DVD player, digital cable box or satellite TV box with digital audio output jacks. From creator to your ears, the multi-channel audio is stored on a disc or broadcast over TV, cable or satellite TV, decoded by your receiver, amplified and sent out to loudspeakers. In order to setup true 5.1 surround sound, you'll need a surround sound receiver with digital audio inputs: fiber optic or digial coaxial. Without an Audio/Video Receiver with at least Dolby Digital 5.1 and digital audio inputs, you'll have to use stereo surround. That means you'll get sound from all your speakers, but it will not be surround sound. Rather than playing the 5.1 soundtrack from your DVD, your receiver will take the stereo track and decide what to play in the rear speakers. Your subwoofer will be underused, and you'll hear much of the same out of your front speakers as your rear speakers. If your receiver has digital audio connections, your DVD player, digital cable box, TV etc. has to have them, too. You'll also want to have a subwoofer pre-out on your receiver. This is usually colored purple and included with a whole set of inputs labeled "Pre-Outs". Check your receiver's manual to determine whether or not you have a subwoofer pre-out and to figure out where it is on your receiver. If you don't have a sub pre-out, there's an alternate way of hooking up your subwoofer, but its not optimal. Your bass will be drastically reduced and you won't "feel" it as much. The Y-adapter is optional but recommended. Your subwoofer expects two inputs from your receiver, but for your use, you'll only be outputting one cable (from the subwoofer pre-out) to the subwoofer. The Y-adapter is the optimal method of hooking up your subwoofer, but if you don't have one, just plug the cable from the receiver into either red or white RCA inputs on your subwoofer speaker. If you don't have digital audio inputs on your Audio/Video receiver and/or DVD player, you'll need a pair of RCA cables (red and white). And if you don't have a subwoofer preout, you'll need a little extra speaker wire. Connect a digital audio cable from the source device (DVD player/cable or satellite TV box) digital audio out, to the A/V receiver's digital audio input. You can use a digital coaxial or optical cable. Either one will work fine. The coaxial cable is typically more robust than the optical cable for wear and tear but the real benefit of optical fiber cable for audio is that it is not susceptible to line noise or other electromagnetic interference.  Audio Signal - Digital audio bitstream.  Originally limited to 48 kHz at 20 bits. except Dolby Digital Plus, TrueHD and DTS HD audio streams.  Bandwidth -	Originally 3.1 Mbit/s; Now 125 Mbit/s. 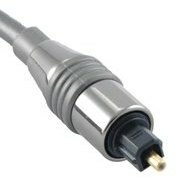 Digital audio cables for bitstream audio connections can be optical or RCA coaxial (or HDMI 1.3). The optical cable can be recognized by the connector at each end. It is round like the RCA coaxial cable however, there is a hole for the light to come out and the connector has edges so it fits into the jack properly. Optical uses light to transmit the data and coaxial uses electricity over copper wire. The RCA coaxial cable connector is just a single round pin with a collar. There are two types of digital audio transmission (three if you include HDMI cables which carry both digital video and audio) - coaxial and fiber optic (optical) and they use two types of cables - coaxial and fiber optic (also known as Toslink). A coaxial cable is a shielded cable with a RCA type connector on each end. An optical cable contains a fiber optic strand encased in a protective clading and rubberized case with molded connectors on each end. It's a toss-up as to which is better. Neither actually offers an advantage as far as sound quality - however convenience and reliability factors give coaxial some advantage. Fiber optical cables can be damaged if not handled carefully. Likewise the emitter or receiver is more likely to fail on a fiber equipped unit. Coaxial cables on the other hand are sturdier than fiber and less likely to be damaged by prying hands and there is no optical emitter/receiver to fail on coaxial systems. In addition to being more reliable in the long run - coaxial cables are much more economical than fiber. Fiber can run from $20 at retailers to more than $50 for a premium brand. HDMI cables are relatively new to the home theater scene and are incredibly convenient. The HDMI cable carries both video and audio in digital loss-less format to HDMI equipped display devices or A/V receivers. Be aware that a lot of HDMI "pass-through" A/V receivers do not actually sample the audio from the HDMI cable. These "pass-through" receivers require an additional fiber or coaxial cable from the source to the A/V receiver for audio. HDMI 1.3 is designed to enable higher bandwidth transmission for High Definition audio sources from Blu-Ray discs such as Dolby TrueHD. Its important to understand that you can't just put your speakers (or subwoofer) in any old place in your room. You need to consider distance, angle, level (vertical height), and if there is anything blocking the sound. Considering distance, you should make sure that your front speakers and center channel are are located close to the TV. Its OK to space your front left and right channels out towards the walls, but don't put them further out than where you'd be sitting. Rear speakers should be spaced out equally to the fronts. They will also need to be as directly behind your seating as possible. They don't do a lot of work in most movies, and most of the work they do is typically quiet compared to the front speakers. The subwoofer can be anywhere between where you sit and the TV. Optimally, place it closer to the TV and more to the center of the room. Don't block the side of the subwoofer where the air comes out. You also don't want to put the subwoofer behind dense objects, doors, walls, or in closets. When possible, let the subwoofer rest on the floor itself. Putting it in a cabinet or anything else that raises it off the floor will diminish its effects. When positioning your speakers, make sure the front, the center, and the rear speakers are aimed straight out towards where you sit. The subwoofer doesn't matter as much as long as it is not directly blocked by anything. You obviously don't want your speakers facing the floor, the wall, or the ceiling. The height of your speakers should match your ear level when sitting. That means if you're mounting your speakers, don't put them at ceiling height. The subwoofer is always best on the floor, and rear speakers need to be as close to ear level as possible. An exception is the center channel. Its not always possible to get it just where you want it since it is, afterall, in the center - right where your TV is. You can safely place a center channel above or below your television, but keep it away from the ceiling and the floor. You should have already figured out how much square footage of speaker wire you needed and made sure you had that (and a little extra). Now you can lay that cable out. Start connecting the speakers one by one and running the wire back to the receiver. Do whatever concealing of the wires you have planned at this point. You can always change it up in the future. You're going to want to make sure you connect the right speaker to the right jack on your receiver. First recognize that you will be connecting positive (+) and negative (-) wires on your speakers and on your receiver. Most speaker wire is either colored differently or has writing on one of the cables to designate + vs -. As long as you match it up on both ends (the speaker and the receiver), you're going to be fine. Just don't use one of the wires as positive on your speaker and then the other wire as positive on your receiver (or other similar situation). Crossing the wires is a no-no and can result in damage (or possibly fire). Keep it simple and use the same scheme for every speaker. Determining which speaker is which is quite simple. Stand in the center of your room and look at your TV. The speaker to your front left is just that - front left. Then you have center and front right. Behind you and parallel to your front left is your rear left. Opposite that is rear right. Now you know which is which on your receiver. If you have a Y-adapter, go ahead and plug that into your sub's red and white RCA inputs. Then plug a subwoofer cable or an RCA cable (if you have a red and white pair, just select either the red or white and let the other cable dangle) into the Y-adapter. The other end goes into your receiver's subwoofer pre-out. Now plug the power in for your sub and you're finished with connecting the subwoofer. If you don't have RCA inputs on your subwoofer, you might not even have a power cable for it either. That means you sub is unpowered. It will not and can not sound as impressive as a powered subwoofer. Consider upgrading your subwoofer if this is the case. Either way, if you don't have RCA jacks (or your receiver doesn't have a subwoofer pre-out), you've got to connect the sub a bit differently. You'll notice some speaker wire jacks on your subwoofer. There should be four pairs of them (two inputs, two outputs). What you have to do is run your front left and front right speaker cable into the left and right speaker ouputs on the subwoofer. Yes - that means instead of running the front speakers to the receiver, they go to your subwoofer's outputs. Next, use more speaker wire (this is where the extra comes in handy) to connect the speaker inputs on the subwoofer to the left and right speaker jacks on your receiver. Make sure you're going left to left, right to right (check the labels) and not crossing positives and negatives (remember your wiring scheme). Once you've done that, you're all set with your subwoofer. Now you just need to run audio cable from your DVD player, cable TV box etc. to your receiver. If you have digital coaxial or fiber optic inputs on both the receiver and DVD player, choose one of them and connect the output on your DVD player, cable TV box etc. to the input on your receiver. Be careful because there is most likely one or more digital coax or fiber optic outputs on your receiver as well. You want to use the digital audio INPUT. If you don't have digital connections, run a pair of red and white RCA cables from the outputs on your DVD player to an input on your receiver. Connect your DVD player, cable TV box, satellite TV box etc. video output to your TV (using composite, component, s-video, HDMI, or DVI). The last thing you need to do is select the input you are using on your receiver. If you're using a digital connection, refer to your receiver's manual. You need to select which digital input you're using (usually labeled Digital 1, Digital 2, etc.). Its simple but every receiver is different. Yours might even automatically select the DVD player if it is the only digital input connected to the receiver when you turn on the DVD player. If you're using analog (composite, red and white) connections, just select the input you used. They might be labeled Video 1, Audio 1, TV, DVD, CD, or some similar label. The back of your receiver should tell you what input you're using. If you followed the directions here, you're going to enjoy your fully connected surround sound system. Hopefully you've got a digital connection between your DVD player and receiver so that you're getting real surround sound. A "receiver" serves as a command center for either a basic audio system (a stereo receiver) or as an elaborate audio-video routing, switching, surround decoding and amplification center for a multi-source audio-video system (a 7.1 channel surround AV receiver). In both cases, the receiver will contain an AM-FM radio tuner and either two internal amplifiers (stereo) or, most commonly, seven amplifiers, for 7.1-channel surround sound. Now that Dolby Digital 5.1 surround sound has become the standard for HDTV broadcasts and the vast majority of DVD and Blu-ray movie soundtracks, it makes sense to get an Audio/Video surround sound receiver, even if you just use it in stereo. The increased realism of surround sound is very seductive, not just for movie watching but for all genres of music listening. It is, after all, the way we hear in real life, with sounds coming at us from every direction, and it makes acoustical sense to reproduce it that way. Moreover, a basic A/V receiver costs little more than a stereo receiver and gets you a lot more versatility and listening options. Although some new A/V receivers have connections for internet radio surfing and many are XM/Sirius satellite radio ready, a canny shopper must still consider basic output power for a given room and listening taste before going on to the more exotic features. It's a receiver's first duty to amplify the weak incoming audio signals to a level where they'll drive loudspeakers to clean, reasonably high volume levels in most typical living rooms or home theaters without audible distortion. The first thing to look for is the receiver's rated per-channel output power into an 8-ohm load. (Most domestic speakers are either 8 ohms or 6 ohms impedance, which are essentially identical for purposes of power output). The biggest problem with the per-channel rating is that it is frequently only one channel driven, so that every added channel will reduce the per-channel output power e.g., "100 watts per channel" is actually 50 watts per channel with 2 channels driven and 14 watts per channel with 7 channels driven. This recent habit of taking the 100 watts per channel and multiplying it by 7 ("100 watts x 7") to get the so-called "total power" is complete nonsense. The only method to determine how much power an A/V receiver truly generates is to separately measure the total watts produced by each channel, or to drive 5 channels simultaneously and measure the output of each. To cover all but very large rooms and extremely high-volume playback, most people will be quite happy with A/V receivers rated at between 70 and 130 watts per channel, with two channels driven. Although many A/V receivers will deliver far less than that when all channels are driven simultaneously, it's not a severe drawback. Even with the most raucous movie soundtracks, it would be extremely rare to ever find an A/V receiver having to produce simultaneous output of 70 watts or 100 watts into each of its 5 or 7 channels. Typically, the surround channels demand far less power output (a few watts) than do the main left, center, and right channels, which carry the bulk of the acoustical output demands. Your A/V receiver performs a source selection function, allowing you to choose which components (DVD, Blu-ray, cable- or satellite TV, CDs, videotape, iPod and MP3) to listen to and watch, so keep in mind how many audio/video sources you may want to connect now and in the future. That may include an aging VCR for all those older videotapes or perhaps even a turntable (that input is called Phono, and only some A/V receivers have it) for a vinyl record collection. All receivers should have inputs for the full range of video connectors -- composite, S-video, component video, and HDMI. With the popularity and standardization of HDMI, the DVI inputs have largely disappeared. If you have an older DVD upconverting player with only a DVI output, you can get a DVI/HDMI adaptor. With increasing price, the number and variety of inputs and outputs, especially HDMI, increases. The over-$1,000 models typically feature three or more HDMI inputs, and plenty of analog and digital inputs and outputs, both optical and coaxial. Entry-level A/V receivers may offer only simple HDMI switching of connected components but you'll want to make sure that whichever AV receiver you choose, the HDMI "version" is compatible with your HDTV's input and with any upcoming purchase of HDMI-equipped components such as a Blu-ray player or gaming system. The latest HDMI version is 1.3, but earlier versions will carry many of the high-resolution audio formats. If you anticipate getting a separate power amplifier with much greater power output in the future, then make sure the AV receiver has "pre-outs" (preamplifier output jacks) for all channels. In most installations, your A/V receiver will do much of the work of "decoding" the various new and older surround sound formats. There are now ten surround formats, Dolby Digital 5.1 being the standard of HDTV broadcasts and standard DVDs. Dolby Pro Logic II x. The "important" surround formats on inexpensive A/V receivers are Dolby Digital and Dolby Pro LogicII x, now almost universal on even entry-level models. You'll also find various DTS codecs comparable to the Dolby Digital variations, which some enthusiasts like better for DTS's somewhat exaggerated deep bass effects. If you want to have the latest high-resolution multi-channel audio formats -- Dolby TrueHD, DTS-HD (Master Audio) and Dolby Digital Plus -- common to Blu-ray high-definition discs, you'll be looking at A/V receivers in the upper price range. However, as Blu-ray and its associated hi-res soundtracks become more common, prices will fall. In early 2008, Onkyo announced an A/V receiver (the TX-SR606 Onkyo TX-SR606) in the $500 price range that will decode Dolby TrueHD and DTS-HD (Master Audio) as well as having four HDMI 1.3a-compatible inputs. Expect other brands to follow Onkyo's lead. A lower-priced A/V receiver (or an older model) lacking these capabilities doesn't mean you can't hear the newest soundtrack formats from a Blu-ray player. As long as any A/V receiver has a multi-channel (usually eight) analog input set, then a Blu-ray player will do the decoding of Dolby TrueHD, DTS Master Audio or Dolby Digital Plus, and route the signals to the Blu-ray player's analog 6 or 8-channel outputs. It just means a complex connection, with either six or eight analog RCA cables between the Blu-ray player and your A/V receiver's multi-channel input set. Make sure the A/V receiver has a legible on-screen display so you can navigate the receiver's settings during setup and calibration. Most AV receivers will have on-screen options for component-video outputs, but typically only more expensive models offer an on-screen display with the HDMI outputs. Even inexpensive A/V receivers now have some type of auto-setup mode, with many including a supplied microphone and auto-calibration/equalization circuit (Audyssey is very common) that claims to adjust the frequency response of the system's speakers to match the room's characteristics. While the auto-setup modes are initially useful for first-timers, they are still prone to error, sometimes setting speakers that are small to "Large" and making errors in speaker level settings of 4 dB or more. You should still do a manual check using a sound-level meter and a pink-noise signal. Your new HDTV set will automatically do its own video processing, "scaling," de-interlacing and trans-coding (convert) incoming video signals in order that they conform to your set's specific fixed-pixel array (the latter is common to all plasma, LCD, and DLP displays). Many A/V receivers also contain video processors that will perform similar functions. The question remains as to which unit -- your AV receiver or DVD player or the HDTV -- does a better job. It's generally agreed that there should only be one conversion take place for maximum picture quality; adding more than one may degrade the video image and add various visible processing artifacts. In any case, be sure to set your HD cable-TV converter box (or satellite receiver) to output video at the native resolution of your HDTV display (720p or 1080i). If you have a 1080p display, try setting the cable box to either 720p or 1080i and see which produces the better picture. 1. Transcoding, which is converting one signal format like S-video to another, say component video. 2. Deinterlacing, which converts an interlaced video signal (480i or 1080i) to progressive-scan, e.g. 480i to 480p or 1080i to 1080p. 3. Scaling, which alters the video signal from one resolution to another, like going from 480p to 720p.